The desire to establish a Budapest-based European Talent Centre arose at the International Talent Support Conference in 2011, organised as part of the Hungarian EU Presidency programme. In the final declaration of the Conference, hosting also the First European Talent Day, the participants proposed "to create a European Talent Centre - Budapest to foster, co-ordinate and monitor the joint European talent support activity". Thus, the European Talent Centre - Budapest was established by the Hungarian Association of Talent Support Organisations in 2012, and received funding from the National Talent Fund, which enabled the EUTC to start operation. 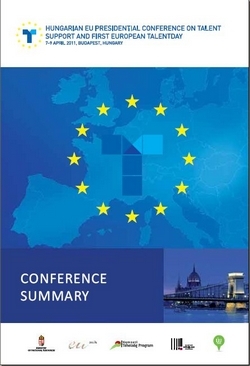 For more information on the mission and planned events of the European Talent Centre - Budapest, please visit the relevant pages of this website and EUTC Brochure on Towards a EuropeanTalent Support Network. The staff of the European Talent Centre - Budapest is happy to receive your comments, suggestions or enquiries at network@talentcentrebudapest.eu.